Partial dentures are used to replace one or several missing teeth and are removable. 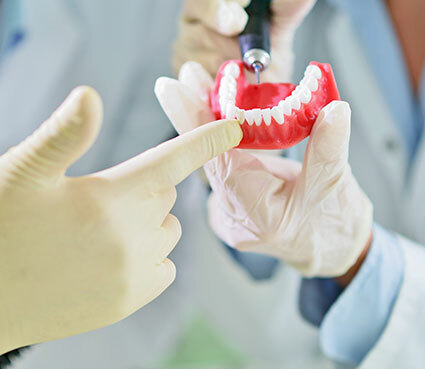 Our experience in tooth selection (shade, shape) and setting allows us to make dentures that blend into your natural dentition restoring your smile and confidence. Acrylic (plastic) Partial Denture. In this style of denture, denture teeth are bonded to an acrylic base. Clasps (hand wrought wire clips) are often used to hold the denture in place. Cast Metal Partial Denture. These dentures are constructed using precision casting techniques and can be made from either gold or chrome alloy. They are considerably less bulky and much stronger than an acrylic partial denture. 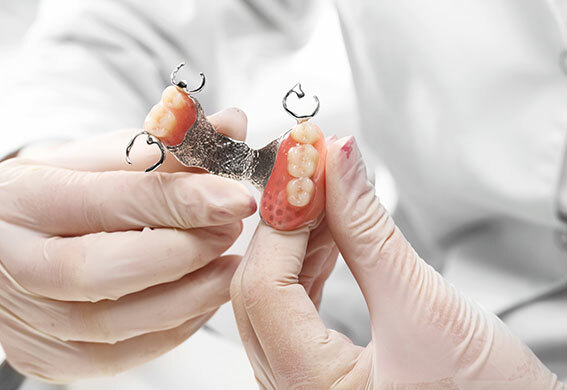 Our patients find cast partial dentures more comfortable to wear than acrylic partial dentures. Gold alloy is chosen by those few patients who are highly sensitive to non-noble metal alloys. Flexible Dentures. Made with a flexible base material, their design eliminates the need for unsightly metal clips and are extremely comfortable to wear and almost undetectable in the mouth. We generally only recommend these dentures for situations replacing one or two teeth. Hybrid Partial Denture. Combining cast metal and flexible denture technology these dentures offer the strength and lightness of a cast metal denture along with superior aesthetics.